2 Wheel Tractors have many advantages for farmer's who own small land. The Power/Tiller Two-wheeled tractor is a dual-function tractor that can be used as a means of traction as well as drive. The main features are its simple and compact structure, good reliability, long service life, easy operation, ample output, light weight and good cross country ability. It is suitable for use in paddy fields, dry fields, orchards, vegetable gardens and hilly land with a little inclination. 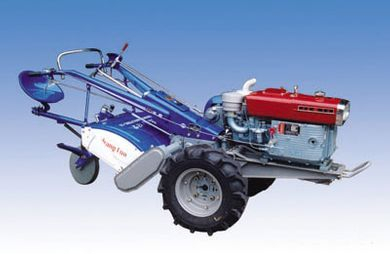 It can be used for tilling, plowing, harrowing in paddy fields, harvesting, drilling, ditching, and transportation. Two wheel tractor is easy to use on small land. Two wheel tractor is light in weight, therefore it does not press the soil. Two wheel tractor can do several tasks at the same time: plowing, cultivating, and covering. Two wheel tractor does not plow very deep and it will prevent from soil erosion. Two wheel tractor does not cultivate deep, and seeds germination will be 100%.